It has been observed that the candidates unknowingly commit certain avoidable errors during the course of their SSB. So we have mentioned some of them mistakes committed by students in the SSB which somehow affect to their results which we want they should not repeat when they go for SSB. Read the article below and see if you have done such mistakes before. 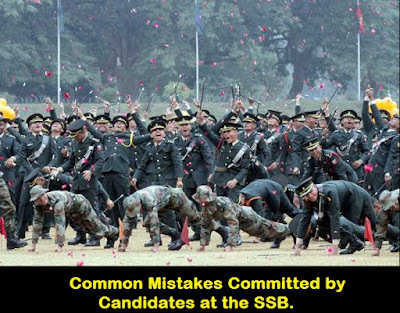 Feel Free to ask in comments below for any queries or questions in minds regarding Common Mistakes Committed by Candidates at the SSB. 1. Reporting late for SSB and not being fully equipped for SSB as per the list of items (clothing and other materials), given in the call up letter. 2. Not carrying all the requisite documents, resulting in avoidable harassment. 3. Displaying social adjustment problems by being critical or too demanding with respect to administrative back up (like, messing, accommodation etc.) being provided by the selection centre. 4. Demonstrates rude behavior towards the administrative staff of selection centre. 5. Not being appropriately dressed, unshaven or improper hair cut/headgear, wearing chappals etc. 6. Indulging in improper conduct and getting involved in disciple related problems. 7. Being not attentive during various briefings by assessors and later asking irrelevant doubts. 1. Not being attentive while others are reading their individual story. 2. Not being able to complete writing the story in the given time and not reading it out properly. 3. Not qualitatively contributing towards the formation of the group story during the discussion phase. 4. Continuing to repeat his/her own story only during the group discussion, rather than effectively contributing to create the common group story. 5. Becoming overbearing in the group, not allowing others to speaks and disrupting the discussion. All points given for PPDT are also applicable for GD & GPE discussions. 1. Displaying self centered attitude whenever engaged in group activities. Must always give priority to group goal. 2. participating more vigorously only when he ‘thinks’ the GTO is observing him and has a ‘put on’ behavior rather than being natural. Also trying to attract his attention. 3. Displaying a general lack of enthusiasm/lack luster behavior and negative body language. 4. Trying to steal the thunder from others by inappropriate means, eg, letting down others or by repeatedly highlighting their mistakes. 5. Displaying a complaining attitude e.g., “we could not complete the task because other were incompetent or uncooperative, “time was not adequate”, etc. 6. Poor time management while attending tests, especially, psychology (psych) tests. 7. Attempting the tests, especially psych tests, with emphasis on quantity and not quality of responses. 8. Responses in various psych tests being pre-learnt/stereo-type which shows lack of originality, creativity and imagination. 10. Trying to bluff the interviewing officer (IO) or (GTO, thereby getting caught in his own web. 11. Lack of general awareness and knowledge of current affairs. 12. Inadequate verbal and written power of expression. 13. Not developing the capacity to differentiate the relevant information from the non- relevant and giving responses at a tangent to what is asked. 14. Not giving to the point answers to the IO and being verbose. 15. Not maintaining appropriate comfort level and being nervous during the interview. 16. Being shabbily dressed with sloppy bearing especially for the interview. Also Read: How to get Screened In for SSB ? This was all about Common Mistakes Committed by Candidates at the SSB which we have mentioned. If you come to know more mistakes kindly share with us below in comments. Kindly follow us for more SSB guidance and latest updates. Wish you all the very best!!! !